Ever since I can remember I’ve been a writer. I started with copying words and definitions from the dictionary when I could barely read, moved on to writing my own short stories during my elementary school years and eventually started journaling when I really started struggling with different issues and situations as a teenager – and even now as an adult. 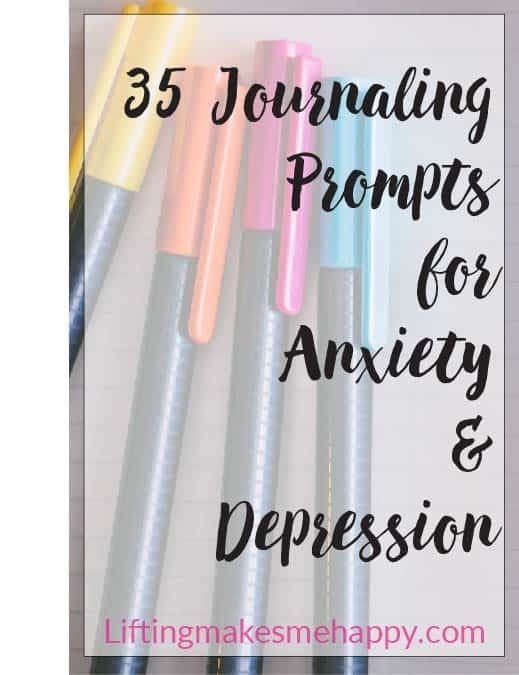 I’ve chosen 35 journaling prompts to share with you. One for each year I’ve been alive. Eeek! I’ve tried to choose my favorite ones that take a bit of thinking so that it’s almost like therapy for anxiety and/or depression. Below the prompts, you’ll find a few of my best tips I have to share for journaling. Write an unsent letter to somebody to get something off your chest. List your top 3 fears. What is your favorite quality that you possess? If someone you knew well described you in 3 words, what do you think they’d say? How has depression and/or anxiety made you stronger? How has depression and/or anxiety challenged you? I showed a lot of strength when ________. Where would you like to see yourself in 1 year? 5 years? 10 years? Write about your biggest accomplishments. List songs that make you happy. List 5 of your favorite affirmations. Make a collage of things you love. Journaling doesn’t have to always be writing! Write in detail about a time you were really embarrassed. List your favorite qualities in people. Write about one of your saddest memories as a child. What happened? How did it make you feel? Write about something you never received from your parents that you needed. I’m afraid people won’t love or accept me if I told them ________. If you had a free day to spend it however you wanted to, what would you be doing? How do you think strangers perceive you? What do you wish people knew about you and why? A challenge I’m currently facing is ________. Make a huge list of things that make you happy. List some organizations or causes (animals, illnesses, social issues, etc.) that interest you enough to support them with your time and/or money. And why? What were your favorite cartoons to watch as a child? Write a #SurvivorLoveLetter to yourself or somebody you know. Write a thank you letter or appreciation letter to somebody who has/had a positive impact on your life. If it were your last day on Earth what you be doing? Eating? I hope you will find these journaling prompts and tips to be super helpful. I know sometimes I think about journaling and I’m just not sure what to write about so I always look for prompts to get me started. awesome tips by the way.